Adam Beck Hydroelectric Stations, Ontario. Renewable energy technologies provide about 17% of Canada’s total primary energy supply and about 65% of its electricity production, as of 2016. The majority of renewable energy produced in Canada comes from hydroelectricity. It supplied 58% of total electricity production in 2016 making Canada the second largest producer of hydroelectric power globally. Wind power is a fast-growing sector of the energy market, accounting for 5% of electricity production in 2016. Globally, Canada was the eighth largest producer of wind power in 2016. Canada has also built many[quantify] photovoltaic power stations, mainly in Ontario, with one in Sarnia, being the largest in the world at the time of its construction. A 15-megawatt tidal plant sits at Annapolis, Nova Scotia, and uses the daily tides of the Bay of Fundy to generate electricity. Politicians have expressed interest in increasing the percentage of Canada's electricity generated by renewable methods. Ontario has created a subsidy to assist wind and solar power producers. A Statistics Canada study has found that all environmental and clean technology activities accounted for 3.1% or $59.3 billion of the Canadian gross domestic product in 2016, edging up from 3.0% in 2007. The number of workers employed in the environmental and clean technology sector in 2016 was 4.5% higher than in 2007, compared to an 8.4% increase for the total workforce over the same period. Canada has about 75 gigawatt (GW) of installed hydroelectric capacity, that produced 392 terawatt-hours (TWh) of electricity in 2013. Manitoba, British Columbia, Newfoundland and Labrador, Yukon and Quebec produce over 90% of their power from hydroelectricity. In 2014, Canada had 542 hydroelectric stations with an installed capacity of 78,359 megawatts. 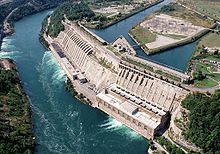 Hydroelectricity has developed in Canada where geography and hydrography have permitted, particularly in Quebec which generates half of the hydroelectric power produced in Canada. Yet environmental and social issues will persist if sustainable hydro-power projects are not planned carefully. Some examples of this include stagnation of water, fish migration issues, uprooting of communities, habitat loss and possible extinction of species. Southern Canada has plentiful solar energy resources, with the most extensive resources being found in southern Saskatchewan, Alberta, Manitoba, and Ontario. With 1210 megawatt peak (MWp) of installed photovoltaics in 2013, Canada ranked 15th in the world. Ontario has a program of moving away from coal and promoting renewable resources which has led to many industrial-scale photo-voltaic plants being built. Located in Sarnia, Ontario, the 97 megawatt Sarnia Photovoltaic Power Plant can power more than 12,000 homes, and in October 2010 was the largest solar farm in the world. Other plants include the 23.4 MW Arnprior Solar Generating Station and a 68 MW solar farm in Sault Ste. Marie. Until recently, the main applications of solar energy technologies in Canada have been for solar thermal system applications for space heating, water heating and drying crops and lumber. In 2001, there were more than 12,000 residential solar water heating systems and 300 commercial / industrial solar hot water systems in use. These systems presently comprise a small fraction of Canada's energy use, but some government studies suggest that they could make up as much as five percent of the country's energy needs by the year 2025. Canada has many regions that are sparsely populated and difficult to reach. Photovoltaic (PV) cells are increasingly used as standalone units, mostly as off-grid distributed electricity generation to power remote homes, telecommunications equipment, oil, and pipeline monitoring stations and navigational devices. The Canadian PV market has grown, and Canadian companies make solar modules, controls, specialised water pumps, high-efficiency refrigerators and solar lighting systems. One of the most important uses for PV cells is in northern communities, many of which depend on high-cost diesel fuel to generate electricity. Since the 1970s, the federal government and industry have encouraged the development of solar technologies for these communities. Some of these efforts have focused on the use of hybrid systems that provide power 24 hours a day, using solar power when sunlight is available, in combination with another energy source. The National Energy Board of Canada expects that by 2040, solar power will generate 1.2% of the country's electricity while wind will provide 9.5%. As of December 2017, wind power generating capacity was 12,252 megawatts (MW), providing about 6% of Canada's electricity demand. The Canadian Wind Energy Association, the wind industry lobby group, has outlined a future strategy for wind energy that would reach a capacity of 55 GW by 2025, meeting 20% of the country's energy needs. Bio-energy is a source of renewable energy that uses a variety of organic materials, referred to as biomass. Biomass is any biological material in liquid, solid, or gaseous form that is either a product of direct-photosynthesis or indirect-photosynthesis. These products include: wood[wastes], municipal solid waste, manures, agricultural substances, separated household waste and sewage sludge, wastes streams, and also remaining substances found in forestry and related industries. However, the most commonly employed biomass is wood; wood waste is used to produce heat for industrial facilities, create steam for electricity production, and also for water and space heating. Canada has been in a fortunate position, as it has abundant amounts of biomass products available (mainly from the forestry industry). This renewable energy source has been growing within the Canadian industry, providing a variety of new jobs to replace the lost jobs that were formerly reliant on traditional forest-related jobs. Furthermore, after the steep decline in the paper and pulp industry over the past 20 years, bio-energy has become an integral part of Canada's renewable energy sector. In 2014, Canada amassed a total of 70 bio-energy power plants with a capacity of 2,043 megawatts (as seen in the table below), with a central focus on wood biomass. Moreover, a total of 8.7 gigawatt-hours (GWh) of current was created by using wood, organic municipal solid wastes and landfill gas; this was most prominently seen where forestry industries are still prevalent: British Columbia, Ontario, Quebec, Alberta, and New Brunswick. Biofuel is a term that is often used to describe liquid bio-energies, and is a renewable energy that is made from biological material. Biomass from agricultural waste, and crops are predominantly used to make biofuel. Biofuel may be classified into two categories, dependent on their source. Primary biofuel are made from unprocessed, natural materials (e.g. wood chips). Secondary biofuel are made from processed primary energy sources to better adapt them to a broader range of applications (e.g. ethanol). Canada is considered to be a major biofuel producer in the world. Canada produces over 250 million L per year. In recent years, the Canadian government has begun funding the research and development of biofuel production. A 5% biofuel mandate was implemented with coordination between federal and provincial governments back in 2010. Agriculture Canada has provided funding for the sector as well, totalling CAD $10 million through the Biofuel Opportunities for Producers Initiative (BOPI). These funds will aid developers gather the necessary capital to commence biofuel projects nation-wide. Today, production of renewable energy such as biofuels contributes CAD$2 billion annually to the Canadian economy. Fossil fuels account for the majority of energy consumption in Canada. Petroleum and natural gas account for 56.2% of the country's total energy consumption. The depletion of non renewable energy and its increasing costs have been fueling Canada's shift towards finding sustainable and environmentally-friendly alternatives. Biofuels are considered to have many benefits when compared to more traditional fuels. Biofuel reduce greenhouse gas emissions (GHGs) and also reduce the reliance on fossil fuels. Canada is well-placed to become one of the top producers of biofuel in the world, however has experienced a relatively slow start to biofuel production. Canada's potential growth as a global leader in biofuel production exists thanks to a robust agricultural sector, which can produce significant amounts of biofuel feedstocks. Canada produces about 1.4hm of ethanol per year. The implementation of the Environmental Protection Act by the Canadian government in 2008 requires that gasoline in the country consist of at least 5% biofuel. There are additional mandates in place that require at least 2% ethanol in biodiesel and heating oil. That would require that Canada produce at least 2hm of ethanol per year, therefore opening the door to a significant increase in ethanol production in the coming years. This would equate to an additional 1.9 billion liters of ethanol that is needed to be produced to meet demand. Ethanol in Canada is produced from cereal grains. Corn and wheat account for virtually all ethanol output. Quebec has been shifting from ethanol being produced by corn to cellulose ethanol from forests and household waste. The federal government started the Ethanol Expansion Program back in 2008, with an objective to kick-start its production across the country. Subsidies were given to producers to entice them in continuing ethanol production, while reducing GHG emissions. The developments in the biofuel sector will have major impacts on the Canadian economy, especially the agricultural sector in the years to come. There are environmental concerns that are brought about by biofuel production in Canada. These concerns include: water usage, land usage and habitat loss, and nitrogen runoff. The biofuel mandate that was put in place by the government requires that it reviews the environmental impacts of biofuel production every 2 years. However, the reviews that are being conducted are not strict enough to yield a credible result. There are also concerns the multi-billion dollar funding for these environmental reviews is being wasted by the lack of thorough assessment. Ethanol and biodiesel are often cited as ways to reduce our GHG emissions, however there are several other alternatives that can work as well. These include the use of electric cars, and the development of more efficient engines. Furthermore, R&D tax incentives and carbon taxes can ignite energy innovation in Canada, and might demonstrate that biofuel is not the only answer to our sustainable energy needs. In Canada, the authority to legislate and put in place policies on renewable energy is divided between three levels of government — the federal, provincial, and local / municipal governments. Since the enactment of the Constitution Act of 1867, the power to legislate the use of natural resources remains mainly in the hands of the provincial governments as they have the power to govern and manage the natural resources that fall within its territorial boundaries. Accordingly, section 92(a) of the Constitution Act and its amendments from 1982 entails that provinces have total control over the forestry, electricity and other non-renewable energy sources. Furthermore, this also includes the power to put in place taxes and royalties against resource extraction operations. Moreover, provinces also obtained the authority to explore and develop both renewable and non-renewable sources of energy as well as manage facilities (and sites) responsible for generating electricity. Provinces were given authority to manage and plan for the use of provincial lands and thus acquired the right to develop their strategic energy market. Responsibilities of the Federal Government differ completely. They include creating national legislation that regulates the trade and sale of renewable and non-renewable energy both nationwide and internationally. The federal authority also maintains and develops policies regarding fisheries. Moreover, it is tasked to create and enact laws to raise money and taxes of any sort, and as well as manage land resources owned by the Federal Government. Hypothetically, the Federal Government can neither interfere nor act on any territories owned or operated by the province but can indirectly influence them by setting the national agenda. Finally, municipal/local governments which do not have the same level of authority to enact laws as the provincial and Federal Government, do influence the policy-making and implementation process. The power given to municipal governments is outlined in provincial legislation which allows local governments to create by-laws according to its constituency, and also includes issuing its own zoning regulations and construction permits. Similarly, indigenous communities and leaders practice as the primary authority on local native lands and reserves. Any resources that fall within indigenous borders remain under the control of the community and its leaders. As federal and provincial laws are required to be administered within the respective territories of Canada, it is a municipal government that is responsible for implementing such legislation. Ontario's Green Energy and Green Economy Act, 2009 (GEGEA), previously in force, took a two-pronged approach to creating a renewable energy economy. The first was to bring more renewable energy sources to the province and the second was the creation of more energy efficiency measures to help conserve energy. The bill also appointed a Renewable Energy Facilitator to provide "one-window" assistance and support to project developers to help with project approvals. The approval process for transmission projects was also streamlined, and for the first time in Ontario, the bill enacted standards for renewable energy projects. Home owners had access to incentives to develop small-scale renewables such as low or no-interest loans to finance the capital cost of renewable energy generating facilities like solar panels. In 2018 with the election of a Conservative government, the minister of Energy, Northern Development and Mines announced the government was scrapping the Act and cancelling 750 energy contracts at a saving of $750 million for Ontario energy consumers. Numerous civil society interest groups are involved in the renewable energy policy-making process in Canada. These groups vary in their beliefs: they include non-profit organizations, environmental activist groups, as well as corporate interest groups with high levels of investment in industries other than renewable energy. As a democracy it is uncommon for a policy to pass without some form of public participation, typically attended by active individual citizens and various interest groups. Members of these groups can be academic experts with first-hand knowledge of the topic/issue and can provide valuable information to help inform policymakers to create legislation. These groups can also consist of industries that have a stake in an issue area and might lobby on behalf of their private interests whether it is political, financial, or social. Examples of some influential interest groups lobbying the Canadian government in the energy and environmental sector include the Canadian Association of Petroleum Producers (an organization dedicated to representing the interests of the Oil sands) and the Natural Gas industry in Canada. Another private interest lobby group is the Mining Association of Canada, responsible for representing corporations interested in mining projects, and mineral exploration and industrial lobby groups. [note 1].}} One non-profit environmental is the Canadian Renewable Fuels Association (CFRA), an organization committed to the promotion of products and energy made from renewable resources such as ethanol, bio-diesel, and other various bio-fuels. The CFRA regularly works with Federal and Provincial governments in Canada to help achieve GHG reduction targets as well as to attract investment towards the Renewable energy industry. Another example of non-profit groups involved in policy consultations is the International Institute for Sustainable Development: this collective body is committed to promoting sustainable development by conducting policy research as well by interacting with NGOs, governments, and private corporations to develop sustainable environmental policies. [note 2] Governments also recognize influential interest groups that maintain input in the consultation phase of policy-making. The Federation of Canadian Municipalities acts as a voice for municipal/local governments nationwide. The group advocates on behalf of the needs of all Canadian citizens. First Nations communities throughout Canada play an integral part in the renewable energy market. With respect to renewable energy initiatives, they are in support of policies and plans that reduce environmental degradation. Indigenous communities argue that they are neither consulted nor briefed during the planning of projects causing an inequitable relationship between project developers, the government, and the First Nations in the region. In a report abot renewable energy in Canada, with a principal focus on Aboriginal and environmental issues, the emerging problem discussed was the inherent gridlock in the energy development sector. Gridlock occurs because projects fail to recognise the infringement of property rights in First Nations traditional territories[note 3]}} There is an absence of trust between the parties, concerns over environmental degradation, and insufficient shared visions to create a mutually beneficial project. Aboriginal rights, such as hunting and fishing, remain protected under the Constitution of Canada. Renewable energy initiatives are deployed throughout Indigenous communities: Whitesand First Nation, which is a community north of Thunder Bay, Ontario is not integrated within the provincial electrical grid. This is one of the twenty-five communities in Northern Ontario that are solely reliant on diesel fuel. These communities face many challenges, such as blackouts, diesel spills, and the volatile costs of transporting fuel (often by means of ice roads or by air). With diesel generators constantly running throughout winter, Ontario has been working on means to expand the electrical grid. After long delays, Whitesand First Nation with the coordination of the province has been developing a new renewable power station in this community. The energy plant develops organic wood pellets to heat and power biomass locations and facilities. Renewable energy development can also be seen at the Cat Lake First Nations, where this Indigenous community has signed an agreement to install solar power that would generate 40 MW h of energy (which would power an estimated 6,650 homes). In this agreement, the First Nations own 51 percent of the company while the rest is owned by a mining company (AurCrest). Many scholars believe indigenous communities play a significant role within the energy market, and they need to be consulted to ensure a good relationship is created between private corporations and the government. As renewable energy becomes more prevalent, the cheaper cost of implementing (and manufacturing) energy such as solar power, wind power, geothermal power, and bio-energy will result in a more competitive renewable energy market. Northwest Territories - Energy use in the NWT can be split roughly into thirds - 1/3 electricity, 1/3 heating and 1/3 transportation. - Roughly 1/3 of electricity generated in the NWT is renewable, with the majority coming from hydro-electricity and smaller contributions from wind and solar PV. - Roughly 10% of heating energy in the NWT is renewable, with the majority coming from wood pellets and smaller contributions from cordwood. ^ Various other examples of such type of groups include Greenpeace Canada, The David Suzuki Foundation, Canadian Wildlife Federation, and Environmental Defence Canada. ^ The Calder vs British Columbia case-1973- giving indigenous members of Canada Inextinguishable Property Rights. ^ Canada, Natural Resources (2017-10-06). "Renewable energy facts". www.nrcan.gc.ca. Retrieved 2019-01-08. ^ "Environmental and Clean Technology Products Economic Account, 2007 to 2016". The Daily. Statistics Canada. 13 December 2018. Retrieved 21 December 2018. ^ "IEA - Report". www.iea.org. Retrieved 2016-06-13. ^ a b c d e f g Canada, Government of Canada, Statistics (2016-02-19). "Chapter 1". www.statcan.gc.ca. Retrieved 2017-03-29. ^ Kaunda, Chiyembekezo S.; Kimambo, Cuthbert Z.; Nielsen, Torbjorn K. (2012-12-27). "Hydropower in the Context of Sustainable Energy Supply: A Review of Technologies and Challenges". ISRN Renewable Energy. 2012: 1–15. doi:10.5402/2012/730631. ^ Petr, T. (2002). "Cold Water Fisheries in the Trans-Himalayan Countries" – via Food and Ariculture Organization of the United Nations. ^ "Solar Energy Maps Canada (Every Province)". energyhub.org. Retrieved 2018-05-12. ^ "Photovoltaic and solar resource maps". nrcan.gc.ca. Retrieved 2016-04-07. ^ "Large-Scale Photovoltaic Power Plants". pvresources.com. Archived from the original on 2016-01-01. Retrieved 2019-03-14. ^ "Enbridge completes Sarnia solar farm". CBC News. 2010-10-04. ^ "NEB – Chapter 3. Reference and High/Low Price Case Results". 2018-11-20. ^ "Canada Current Installed Capacity" (PDF). canwea.ca. Retrieved 2019-03-14. ^ "Wind Vision 2025" (PDF). Archived from the original (PDF) on 2009-03-18. Retrieved 2019-03-14. ^ "INTRODUCTION TO BIOENERGY". Sustainable Energy Authority of Ireland. Retrieved 2019-03-14. ^ a b c Bradburn, Kendal (2014). "2014 CanBio Report on the Status of Bioenergy in Canada" (PDF) – via Natural Resources Canada. ^ "1. What are biofuels?". www.greenfacts.org. Retrieved 2019-04-05. ^ a b c d e Sorda, Giovanni; Banse, Martin; Kemfert, Claudia (November 2010). "An overview of biofuel policies across the world". Energy Policy. 38 (11): 6977–6988. doi:10.1016/j.enpol.2010.06.066. ^ a b c d e f g h i j Mukhopadhyay, Kakali; Thomassin, Paul J. (July 2011). "Macroeconomic effects of the Ethanol Biofuel Sector in Canada". Biomass and Bioenergy. 35 (7): 2822–2838. doi:10.1016/j.biombioe.2011.03.021. ^ a b c d e f g h i j Laan, Tara. (2009). Biofuels-- at what cost? : government support for ethanol and biodiesel in Canada. Steenblik, Ronald., Litman, Todd Alexander., International Institute for Sustainable Development. Global Studies Initiative., Gibson Library Connections. Winnipeg, Man. : International Institute for Sustainable Development. ISBN 1894784286. OCLC 435739721. ^ a b Branch, Legislative Services. "Consolidated federal laws of Canada, Consolidated Acts". laws-lois.justice.gc.ca. Retrieved 2017-03-29. ^ "Roles and Responsibilities of Governments in Natural Resources". www.nrcan.gc.ca. 2011-06-14. Retrieved 2017-03-29. ^ "Ontario Unveils Green Energy and Green Economy Act, 2009". renewableenergyworld.com. 2009-02-25. Retrieved 2019-03-14. ^ National Energy Board, Government of Canada (2016). Canada's Renewable Power Landscape: Energy Market Analysis 2016 (PDF). Ottawa. pp. 1–39. ISSN 2371-5804. ^ "Ontario Scraps the Green Energy Act". news.ontario.ca. 2018-12-07. Retrieved 2019-03-14. ^ a b c d Canada, Environment and Climate Change. "Key contacts and stakeholders - Canada.ca". www.canada.ca. Retrieved 2017-03-29. ^ Tom G., Svensson (2002). "INDIGENOUS RIGHTS AND CUSTOMARY LAW DISCOURSE COMPARING THE NISGA´A AND THE SÁMI" (PDF). COMMISSION ON LEGAL PLURALISM. ^ a b c Government of Canada (2017-01-13). "Spotlight: Bioenergy in Indigenous communities". Resource Canada. ^ Freeman, Sunny (Jan 6, 2017). "Industry and indigenous communities let the sun in on the shared problem of diesel". Financial Post. Retrieved 2017-03-01. ^ a b c Robinson, Andrew, ed. (October 2016). "100% Renewable Energy in the NWT by 2050 - Starting the Conversation" (PDF). Alternatives North: 11 & 12. Retrieved 2018-01-12. Could Ontario Be the Next Germany? This page was last edited on 16 April 2019, at 02:25 (UTC).